Depending on the exact location in New York City, the cost of a private office space on a monthly basis often ranges from $3,000 to $12,000. For clinicians such as therapists, who often have customers paying out of pocket, that amount of monthly overhead is a significant investment and a substantial business deterrent. Thomas Vega is the Founder & CEO of Serene Offices, a New York Founder Institute portfolio company removing the pain points for therapists and clinicians in search of the ideal non-corporate office space. Serene Offices is a marketplace platform designed to connect commercial property landlords with clinicians looking for specific types of office space, while at the same time helping those clinicians to better market their own services. Serene Offices offers more than just space: locations are with complete soundproofing and other details designed from the ground up for their clients. For landlords, Serene Offices also offers marketing and non-exclusive office management services. Together, this complete marketplace of services adds up to a major a win-win: helping landlords fill their office space vacancies, and helping clinicians find spaces ideally suited to their needs. Currently, the Serene Offices platform caters to than 135 office spaces spread across the five boroughs of New York City. The company owns 27 of these offices, and operates 108 through their partnership network. Of those spaces, many were initially designed as talk therapy offices—but more recently, Vega has began expanding to include integrative wellness and physical therapy spaces as well. The company also has plans to expand into new geographic markets over the coming year, including Miami, Philadelphia, and Washington DC. The eventual goal is to be the Airbnb of Clinical Office Space. The existing commercial real estate market effectively forces practicing clinicians into signing leases that typically last from one to five years—but through Serene Offices, the time requirement can be as low as a single hour. These low minimums make it possible for popup offices to test their offerings in traditionally underserved markets. And while there are some similarities, Vega’s approach is very different from typical coworking spaces, because Serene Offices only offers private offices of less than 5,000 square feet, as well as all the added platform and spatial features specific to the needs of practicing clinicians and therapists. 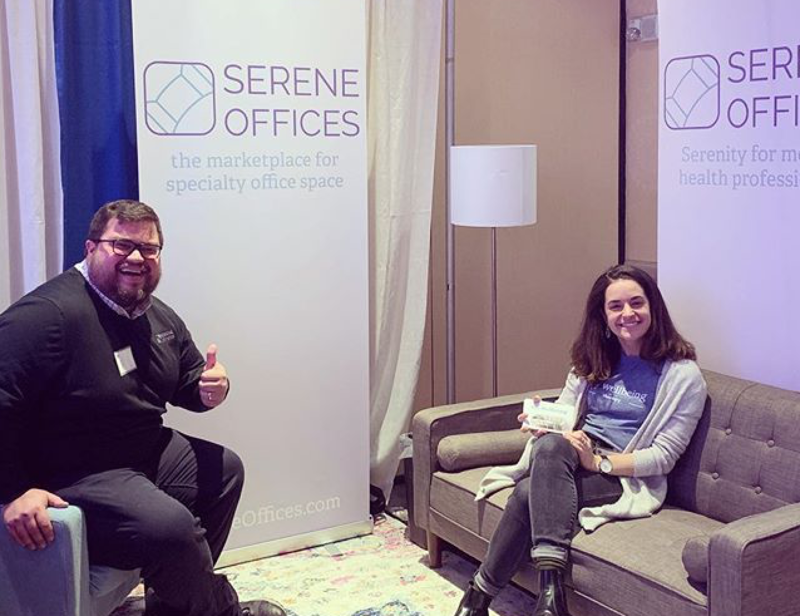 Not only does Serene Offices make therapy spaces more accessible to practitioners, but a core component of the business is in the marketing services they provide. More specifically, this means working to fill the inventory of unused and underutilized spaces. My motivation was due to straight up annoyance with how things were. People were being taken advantage of. They didn’t have any marketing experience, so they couldn’t turn a profit on their spaces. I wanted there to be no market inefficiencies. Landlords don’t hire professional photographers or people to do their websites. I want to provide those services to everyone in the marketplace, to create a flat marketplace. Vega likened his approach to that of Intel, in that there are numerous computer makers on the market, but practically all of the major brands rely on Intel’s processors to function. After Vega’s initial successes in creating a marketplace of spaces ideal for talk therapy, he and his team are now starting to look at new ways to expand on their approach. The obvious next step is with a further focus on clinicians and therapists, such as acupuncture, reiki, and yoga. These spaces are highly specialized and difficult to find—but they are also too small of deals for brokers. Today, Vega and Serene Offices are busy broadening their scope. Next, they are considering offices that require less foot traffic, like those of lawyers and developers. For Vega though, ultimately each space and how they are set up is a key differentiator. Our offices will be set up for each specific use case. There won’t be any square pegs being put into round holes. The market as a whole needs better technology and efficiency. WeWork and others capitalized on an ethos that makes sense, but they are monopolizing on that ethos. We want to give the attention of a cooperative, not a corporation. Instead of a solo win, everyone wins. The Founder Institute is the world's largest pre-seed startup accelerator. Since 2009, we have helped over 3,500 startups raise over $800M and build some of the world's fastest growing companies. Based in Silicon Valley and with chapters across 65 countries, the Founder Institute's mission is to empower communities of talented and motivated people to build impactful technology companies worldwide.